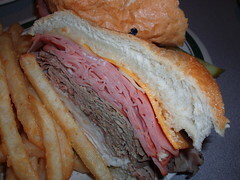 Since I am getting about 1300 hits a day on the post I am linking all you need to know about the Dagwood below. Update: December 2nd, 2008 – there is a lot of buzz on the Dagwood because the Travel Channel program – Man vs. Food has a Columbus segment on the Dagwood (and the Thurman Burger – go figure I wonder where they found out about those two sandwiches). For more Dagwood information and a link to a video – check my March 2008 Dagwood Challenge post. 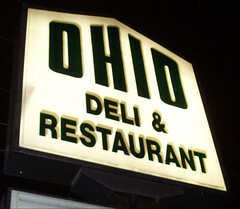 I made recent trip to the Ohio Deli with Members of the Men’s Super Gang (MSG), a group of gentlemen that try to meet once per month to sample the fare our fair city has to offer and to introduce one of our members (an upstate New York Transplant) to the best dining destinations. It had been while since I was at the Ohio Deli. On my previous trip there I consumed their famous Dagwood Sandwich for the reward of a photo on the wall and a free T-shirt. I made it – but just barely. For a couple years I told stories (all true) of how big the sandwich was. When the MSG and I walked in for my recent visit – I convinced them to get one sandwich we could all share. When it arrived, I was disappointed – it was about 1/2 of the size I recalled from my last visit – but – it is the same price, still comes with a T-shirt and is even better tasting than I remembered it. I was kind of incredulous. I kept asking staff about ” what happened”. Most were kind of surprised by my questions..”don’t you think it is big enough”, etc. Finally, one of the employees told me that the bun had changed. They used to order (giant) individual sandwich buns for the sandwiches, now they just cut the bread from a long loaf of sourdough. And it turns out, the size of the sandwich can vary depending on who makes it. This helped me feel better, I did not want to think my previous effort with the sandwich was in vain or not the accomplishment I recalled it to be. Here is tale is about a man, a sandwich, and what happened when the two met. Desperate for anything that resembles an accomplishment, I ventured out to eat the much-ballyhooed Dagwood sandwich at the Ohio Deli. The mission was undertaken some time ago (2004?) – but it took a while to recover and come to peace with what I had done. As has been for most life choices – I cannot be a good example – but I can be a horrible warning. This is the Deal: eat the Dagwood and the fries served with it in 30 minutes and you get a T-shirt and your photo on the wall. While waiting for our table we looked at the pictures of past Dagwood eaters – most seemed kind of troubled yet relieved. The record time is 12 minutes. The bus boy – who looked like a combination of the teenager character and the Cletus character from The Simpson’s told us that the true “champion” is the guy who ate it in 13 minutes then had a piece of pie. (Sir, I salute you – there should be a beer commercial about that!) The busboy was a true supporter. He called us the three stooges and checked on our progress frequently. Mr. Scarlet and Mr. Gray decided to make a go at the Sandwich as well. Mr. Scarlet did not think he could do it, Mr. Gray was ready to show he could. The sandwich could best be described as gigantic fist sized portions of ham, turkey, and roast beef served with garlic mayonnaise, American and Swiss cheese in a bun that is as large as my head (my head is not small, one of 170 reasons I am single). The sandwich is the size of a hefty dinner plate. I regretted eating breakfast and lunch and not really being hungry at dinnertime, I worried about the task at hand. I ordered my Dagwood without tomato or onion but offered to eat some extra fries to make up the difference. As a benchmark I would say the sandwich equals two double beanie burgers (at the Gahanna Grill) or 1 and 3/4 of a Thurman burger (duh, from Thurman’s). I asked Cathy our waitress about the size. She thought the sandwich has two pounds of lunchmeat. The sandwich is big – everyone agrees on that. A couple bites into the sandwich I felt good. A couple bites in Mr. Scarlet felt bad. At the 10-minute mark I had eaten the first half of the sandwich. Mr. Scarlet had 1/4 completed; Mr. Gray was near the 1/2 way point. salty and was going down slow. I disassembled the sandwich and started making mini sandwiches out of the pieces – each mini was the size of a white castle. A few more bites into the sandwich I realized I needed to pee. I decided not to go for two reasons. First, Cathy might think I was cheating. Second – the temptation to throw up would be too great, I had to press on. I continued, somewhere around the 19 minute mark I had a panic attack and possibly went into a fugue state – I lost sense of time. Around minute 23 I came out of this state and saw that Mr. Scarlet was almost done. I still had a solid 1/3 to consume and Mr. Gray was really struggling. At 24 minutes, Mr. Scarlet was done. I burped which gave me the extra strength and belly room to carry on. The feeling I had was similar to what I have read about marathon runners – after you hit the wall and pass through it you know you will make it and a strange nirvana sets in. I moved forward with gusto and finished at 27 minutes. Mr. Gray, still struggling made a bold move and dipped the remaining bun in his orange drink for the extra moisture needed to get that behemoth down. (This is the same tactic used by professional eaters at hot dog eating contests – Eye of the Tiger, baby). He finished at 29 minutes and more than a few seconds – he still had a good number of fries left but Cathy seeing that he had gone the extra mile let that slide. I later learned that Mr. Scarlet – during my fugue episode – had done a series of yoga moves to stretch his stomach, which allowed him to finish strong. You can see the photo of the three of us together on the wall – we are listed as Curly, Larry, and Moe. The “I defeated the Dagwood” t-shirt is a good shirt. That sandwich destroyed me. In the photo, I would not say we look sad, but we do not look happy either. Some suggestions for when you go. 2) Use the pickle on the side as an eating aide – (something I discovered a little late) – a small bite of pickle every 8-10 bites seems to help things go down better. 3) Make sure you have someone with you – you really need the moral support to push through. And you need someone to drive – but that is another story. 5) Exercise, doing a triathalon would be ideal. 6) Have that orange drink ready – no way you want to fall short at the end. Thanksgiving week 2007, I went back to do battle with the Dagwood again. Another thing I forgot, Ohio Deli has awesome fries. I ordered my sandwich. I ate it with plenty of time to spare (you have 30 minutes) and even had time to be interviewed by Kevin Joy from the Dispatch while eating the Dagwood. When I was done, a woman sitting nearby asked me to stand up because she wanted to see where I put the sandwich because she figured someone would have to be bigger than me to put a sandwich away “that fast”. What can I say, I am task oriented. This entry was posted on December 25, 2007 at 7:09 PM	and is filed under breakfast, culinary misadventure, kid friendly dining, restaurants, sandwiches. Tagged: Dagwood Sandwich, Ohio Deli. You can follow any responses to this entry through the RSS 2.0 feed. You can leave a response, or trackback from your own site. the actual record is 6 min. look on the wall of pictures there. I love a good sandwich and this monster-sized one you have here can take some serious work, albeit a really fun and delicious one! Owning a Fort Lauderdale catering business and deli place I have never served a sandwich this big but it sure is inspiring. I am always on the lookout for really great ideas that I can draw inspiration from and your post has got me started in the right direction. I just attempted the Dagwood last week. I am a woman, so did not know what to expect as far as what my body could actually handle. I actually completely finished the sandwich and the pickle, but then had to concede when I had eaten about 75% of the fries. I ate about 90% of the challenge, and would do it again in a heartbeat! One of the strategies I used was to eat all of the meat first, then the bread (and the condiments and veggies), then the pickle, then start on the fries. I didn’t want to feel too full at first, because I knew I wouldn’t even want to think about the sandwich. Does anyone have any suggestions as to what I could have done differently? Any opinions are appreciated! how much is it if you don’t finish it. CMH G. reply: You pay either way. But at Neighbor’s Deli, if you can finish the Monolith Sandwich, you get it for free. In March of 2012, I’m proud to say that I finished the Dagwood Sandwich in 24 minutes and then had a slice of chocolate cream pie. The sandwich itself was delicious and had fantastic cuts of fresh meat. Pound for pound this meal is insanely cheap! And the fries are some of the best I’ve ever had. Kudos to the Ohio Deli! I am no competitive eater. This was my first challenge. I’m 6’2”, 255lbs. Ate a big dinner the night before. Skipped breakfast but downed a lot of caffeine throughout the morning. Drove from Cleveland to the Columbus Zoo. The caffeine gave me energy to walk for hours which in turn built up my appetite. I arrived at the Ohio Deli around 2pm starving. Sat down, ordered the Dagwood and two Old Fashioned Orange Sodas which comes in bottles. When the meal arrived I started on the sandwich immediately. At 11 minutes I finished the sandwich and had one eighth of the fries done. Once I finished half the fries I hit a wall of anguish and suffering. But then I belched a bit, the torment ended and I was able to carry on. The hardest part was the second wall of misery I hit with only 15 fries left. I am more proud of finishing those 15 fries than the rest of the entire meal. Fortitude, Grit, Triumph, Resilience & Determination are a few small words that come to mind when thinking of those 15 fries. My slice of pie arrived a few minutes after I finished the Dagwood and I somehow ate the pie with very little discomfort. –	When eating the meal you will need to mix things up, switching back and forth. So conserve your pickle, bun & drink. –	Beware finishing the sandwich before eating many fries. Those fries may taste fantastic but eating a pound of any fries is a lot of salt to swallow at once. If I could do this over, I would plan it out so that I finish three quarters of the fries at the same moment I finish the Dagwood. –	Bring people that will cheer you on, SIS BOOM BA!